I suddenly got super busy, with the Zip interview and broadcast and I forgot. It’s kind of late, but whatever, I’ll write it now! 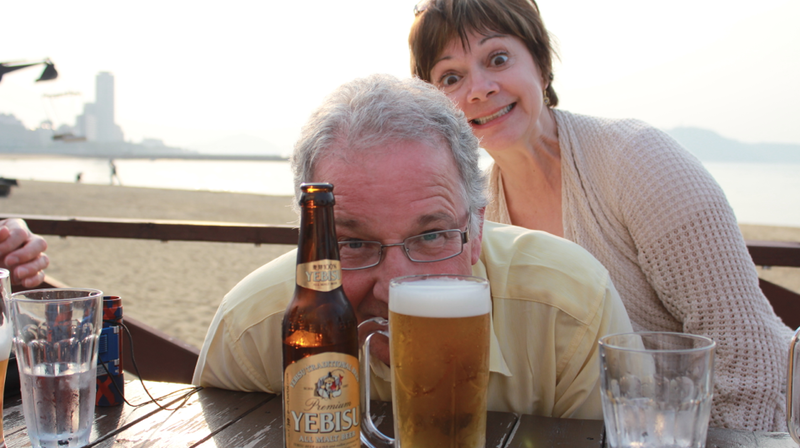 My parents came from Canada to visit me for Golden Week in Fukuoka. 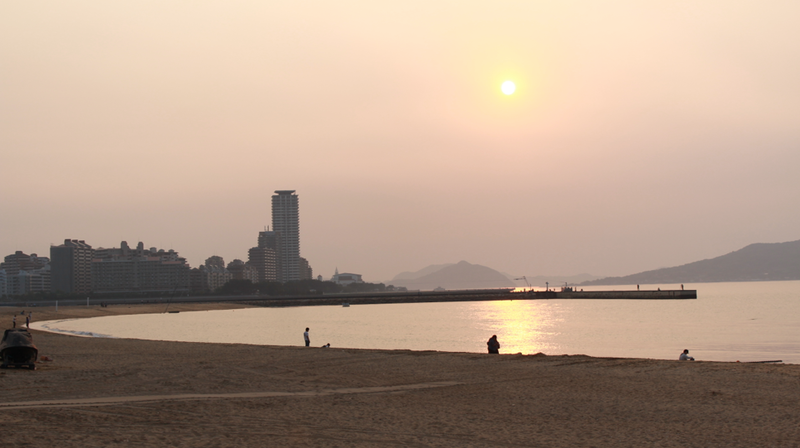 The first few days were cloudy and rainy, but it was warm and comfortable at the same time. 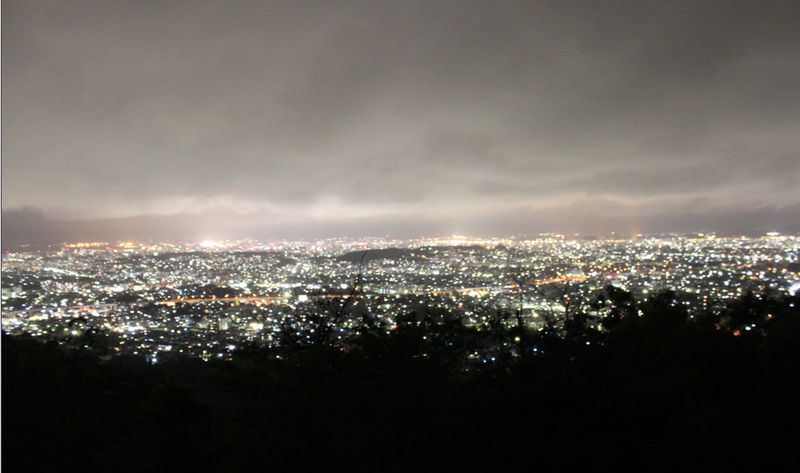 And the view from Abura Mountain was fantastic, even on a cloudy day. 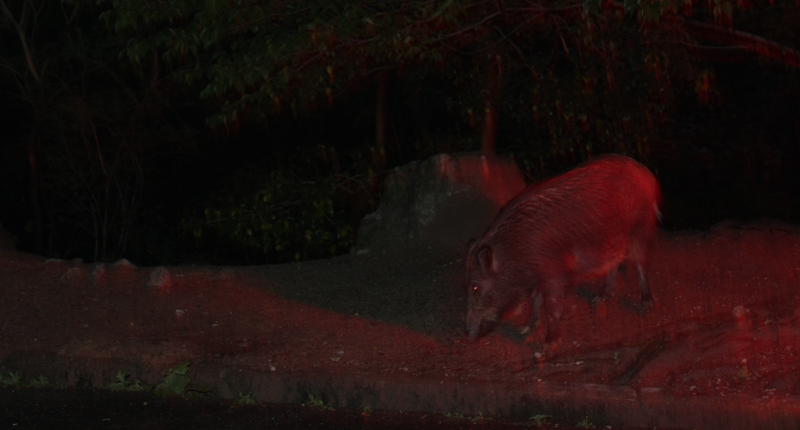 We were lucky to run into a wild boar on our way down from the mountain too! Sorry it’s a little blurry. the latter part of Golden Week was sunny, so we stayed outside a lot! Considering it was still snowing in Canada, my family really enjoyed the beach. Drinking beer at a restaurant on Momochi beach, my parents took in the atmosphere. And played around a bit. I guess you can understand where I get my weird expressions from. Hahaha. Anyway, my family had a great time during Golden Week in Fukuoka. For someone who left their family behind to live in another country, it made me really happy to hear that. I really do like Fukuoka. I am going back to Canada for 2 weeks this August too. Let me know if there’s anything you want me to blog about from Canada! I’ll update my blog sooon! Posted in fukuoka, japan, Only In Japan, Tourism, TravelTagged ももち, イノシシ, ファミリー, ブロガー, プリクラ, ミカエラ, ミカエル, Canada, ciaela, 百道浜, 福岡, 観光, family, fukuoka, japan, kazoku, Micaela, 妹, 家族, 油山, 浜Bookmark the permalink. Awesome! I’ll be around Fukuoka, Nagasaki & Kumamoto for over two weeks this summer. Looking forward to it! I’m all for “off-the-beaten-path” places and activities, you have any particular recommendations for Fukuoka? Hi Ciaela, I saw you on youtube about nils, but i dont know where is the best place to comment, then, a was approved for the COE, now I have to pay, but now that the situation becomes more serious my family is paranoid about this program, they think Nils dont exist! What did you say to your parents in this hour?Thank you! English is not my native language, sorry for the mistakes! That’s pretty amazing =) I’m wondering what part of Canada you’re from, since I’m from Vancouver. Wow, you’ve been a long time in Japan!! Amazing! I partly agree with what you said in the video. I agree that people should leave the “main tourist spots” and explore other parts of Japan. Personally I’ve only been to 41 of Japan’s 47 prefectures, so I’m not one to talk, but there are so many great things to discover far away from Tokyo, Osaka … and also Fukuoka. To me Fukuoka is just another big city. It’s definitely different from Osaka and Tokyo, but it’s still a big city. Don’t get me wrong, I’ve been living not too far away from Fukuoka for 4 years myself, but I’ve only lived in the boonies of Japan – even now that I’ve moved to another part of Japan. Life in the Japanese countryside is completely different from ANY of the big cities. Yet you’ll get to learn much more about Japan than you ever could in any big city. I think it’s great that you want to convince people to explore other sights of Japan! I’m all for it, too! P.S. : I just discovered your blog today. I’ve been in Japan for only 5 years, so I think it’s amazing that you came at a young age and that you’re still here. I also like the fact that you write everything in Japanese as well. Unfortunately there are far too many foreigners out there that have been in Japan for a long time and still can’t speak a word of Japanese. See, that’s the reason why I moved to Kansai now. I still live in the countryside, but I can go to Kobe (which has just the right size and this … international touch to it) or Osaka in no time! What was your major at the music school? OMG! I thought you were half for the longest time until I saw the photo of your parents. You must get that in Japan a lot, right? This piece was a likcajefet that saved me from drowning. “Now I understand why you love Japan so much, it’s such a beautiful country”.